Bandbytes.uk is one of our company owned websites that allows artists to earn much larger royaly earnings than is paid by the market leaders such as iTunes, Amazon etc. We also allow non-signed artists to upload their music and sell digital downloads on a 50/50 basis. Soundblitz Records is one of our Record Labels coveing all genres and decades from the 50’s to present. Our signed artists are International and predominantly come from the UK, USA, Sweden and Italy. Our website also allows for un-signed artists to join free, use the many facilities including selling downloads of their music.and promote themselves. 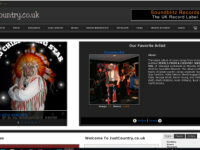 JustCountry.co.uk is a company owned members website that allows both signed and un-signed artist to have their own space on the web. We allow for Free members to have lots of promotional items and widgets that will enhance their careers. All members have download facilities. 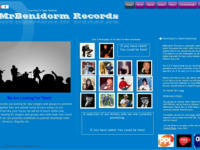 MrBenidorm Records Website gives information on our Record Label and signed artists. It also connects to our download store and radio broadcast. We no longer accept artist on this Label and now promote our latest Record Label Soundblitz Records. JustCountryOnlineRadio is a company owned website and radio broadcast facility specilising in Country Music genre. Mixing unknown artists with the more well known ones. Giving a chance to rising stars to promote themselves free of charge. 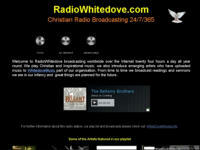 Broadcasting 24 hours a day via the Internet. DennyDigital.com is a company owned digital download site that allows both signed and un-signed artist to give previews of their music that can be downloaded offering a much larger revenue share than the major download sites. 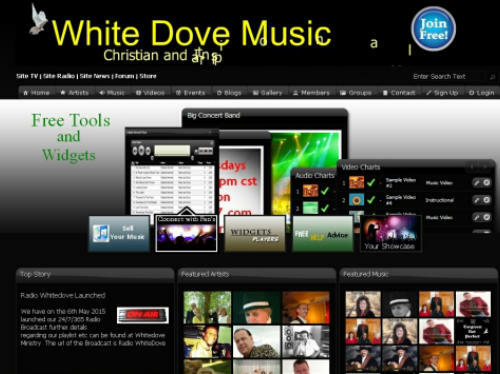 WhiteDoveMusic.info is a company owned website offering both signed and unsigned artists the opportunity to earn from their music by preview and download of digital MP3s. This site is for Christian and Inspirationl music genre. The site is Free to join.